NextGen Player is happy to announce yet another fantastic contest for our readers. 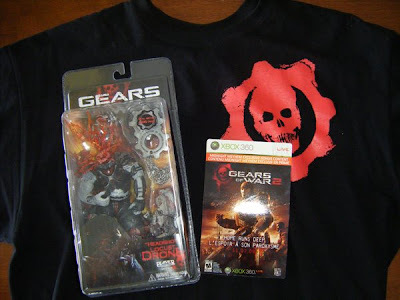 To celebrate the recent release of Gears of War 2, we've decided to hold a Gears of War contest in December. Stay tuned to NextGen Player as we'll announce the contest details on December 1st. Better yet, sign up to our feed burner so that you can easily be reminded when we post the details. On top of that, you'll also receive regular updates on all of the gaming news we report on our blog. The NextGen Player Gears of War Contest will consist of one Grand Prize. Here's a picture of the Grand Prize. This will be an awesome contest so make sure you sign up to our feed burner for regular updates to this and all the other great news we report on in the gaming world. HOLY CRAP I WANT THAT LOCUST HEADSHOT FIGURINE. Can't wait for the contest. It doesn't help that I just recreated that in game several times today.